She is an icon in the world of wellbeing and she is the number one bestselling author of over 35 books on a range of health and beauty topics, including her latest bestseller The Good Menopause Guide. Here, Liz shares her top tips for health and wellbeing during the perimenopause (the time leading up to the menopause) and the menopause itself. View this as a good opportunity to look at your diet and cut back on alcohol and caffeine. Caffeine acts as a vasodilator – which means it causes blood vessels to dilate – so can trigger a hot flush if you’re prone to them. Alcohol and caffeine can both dry the body out at this critical time, so hydrating with water as our collagen levels decline is more important than ever. Not only does water keep skin looking plump and aid concentration, it relieves fatigue and headaches and can help stop energy levels from dipping later in the day. My special ingredients for looking and feeling your radiant best during this stage of life include phyto-oestrogens, which provide oestrogen-like compounds that occur naturally in the plant kingdom. Phyto-oestrogens can help ease many menopausal symptoms, but they’re also tasty and nutritious in their own right. Soya milk and soya flour, linseeds, tofu, Japanese tempeh and miso, pumpkin seeds, sesame seeds, sunflower seeds, celery, rhubarb and green beans all contain phyto-0estrogens. Look for recipes rich in these ingredients, such as one of my favourites from The Good Menopause Guide, baked sweet potato burgers made with kidney beans and chickpeas. Tempting though it may be to reach for an afternoon biscuit, this will trigger a sharp rise in blood glucose levels followed by a rapid drop. During the perimenopause, fluctuating sugar levels lead the body to convert excess energy into fat, which in the long term will raise the risk of type 2 diabetes and CVD. A better option is to choose nuts, seeds or fresh fruit as snacks to restore flagging energy in a more balanced and sustained way or curb your afternoon sugar cravings with a slice of my famous Liz Earle Wellbeing Menopause Cake! To compensate for bone density loss, which is practically unavoidable as time goes by due to lower levels of oestrogen (unless you’re protected by HRT), it’s important to eat foods rich in calcium and vitamin D. Good sources of vitamin D are oily fish, organic eggs, red meat and foods fortified with vitamin D by the manufacturer, such as some breakfast cereals. Dairy products, kale, spinach, cabbage and sesame seeds are all excellent sources of calcium. There’s increasing evidence that exercise can really help with the many varied symptoms of the perimenopause and menopause. In The Good Menopause Guide I’ve included suggestions for a number of different forms of exercise for this stage of our lives including a focus on walking, easy weight lifting and yoga. Leading personal trainer Michael Garry, who I spoke to as part of my research for the book, also says there are three simple stretches (with a focus on hamstrings, quads and calves) we should all do every single day as we get older to protect back, leg and hip mobility. 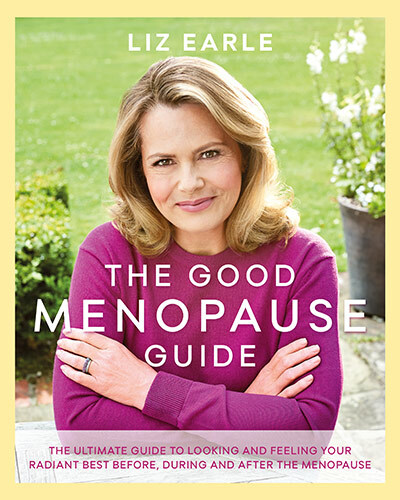 You can find more detail on the menopause section of the Liz Earle Wellbeing website. HRT simply tops up the body’s natural oestrogen that declines as we age and the latest NICE guidelines are very clear: For most women, the benefits outweigh the (often exaggerated) risks. That’s not to say all women can take it, but the majority of women can and will benefit, so it’s important to discuss any symptoms such as insomnia, anxiety, achy joints etc. with your GP. Gels and patches that deliver oestrogen through the skin have been shown to be the safest form, even for those with migraine or high blood pressure. These forms of trans-dermal oestrogen are naturally-derived from the wild yam plant and available on the NHS. The Good Menopause Guide, Orion Spring, £25.